Cheers and Happy Thanksgiving one and all. Author ronna2012Posted on November 24, 2016 December 18, 2016 Categories floral, ThanksgivingTags rosesLeave a comment on Happy Thanksgiving! The temperatures are cooling down, the leaves are changing and acorns are falling. This year’s offering for the Thanksgiving table is a carrot-nut cake, slathered with cream cheese frosting and topped with fondant oak and maple leaves as well as acorns. At our Thanksgiving dinner table, I am reminded of all the things for which I am grateful. Happy Thanksgiving to one and all. I always bring dessert to Thanksgiving supper with my boyfriend’s family and I wasn’t sure what to bring this year. Sweet potato pie? Pumpkin pie? Blueberry? Nah. 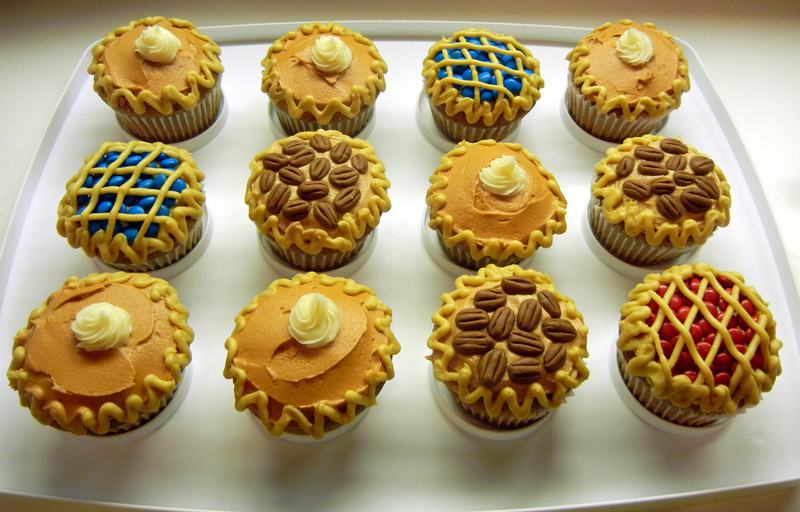 I decided instead to make cupcakes that looked like pie. Sweet!